Right now I'm suffering from a lack of vacation. Sure I've done a few long weekend outings and had time off with the family, but nothing really where I've been able to get away and remove myself from the world in a way that my brain seems to require at least once a year. I have something on the books to look forward to, but right now that can't soon enough and I've found myself reminiscing on vacations of yore to remember the feeling of escape that I'm in eager anticipation of right now. My last real getaway was to Spain over a year and half ago, and as part of my looking back, I've been awash in the fondness of all that I ate there. Mostly those meals were tapas, and I surprisingly found my favorite dishes were those that included only a few ingredients, but they came together in such a way that their centerpiece was heightened to a type of deliciousness I hadn't quite experienced before. 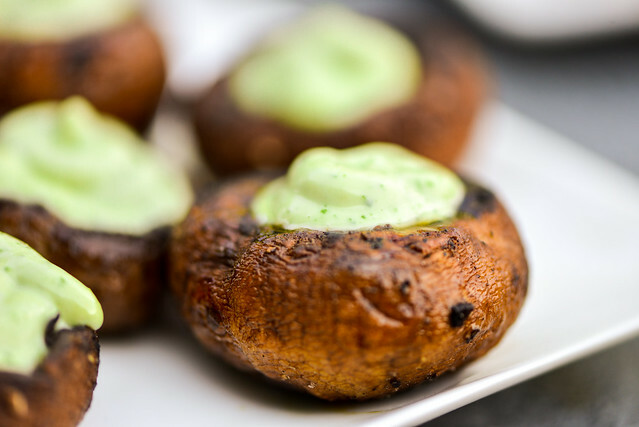 One example of that were these unassuming grilled mushroom caps stuffed with a green mayo that had a great herbal and garlicky flavor. I tried to recreate something similar after I got home, and am proud to say that even if these cremini mushrooms stuffed with basil and parmesan mayo are not a 100% direct copy, they're every bit as incredible as their inspiration. So the Veggiewave was just another cruel April Fool's joke, the meat will continue! There was a little truth in that prank though—it's becoming clear I need to balance my diet better to ensure I'm around for a long to keep enjoying the meaty delights of life. So while you can breath a sigh of relief that we won't be all veggie, all the time, there will certainly be some more sides and main that could be construed as a "healthier options," but that doesn't mean they aren't incredibly delicious. Take these pimientos de Padrón for example. 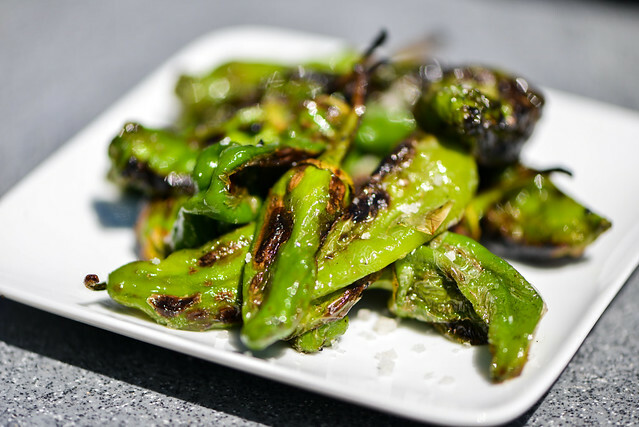 They're basically just peppers (fruit), olive oil (good for you oil), and a little sea salt, but they're so tasty that I have no problem devouring an entire plate of them in one sitting. If all has gone well, I'm into my second week of a three-week jaunt around Spain, now enjoying the sights and tastes that Sevilla has to offer. Even on vacation though, the wave of meat shall not cease, and I've done some prep ahead and put the blog on autopilot to continue to fill your eyes and bellies with great grilled treats. 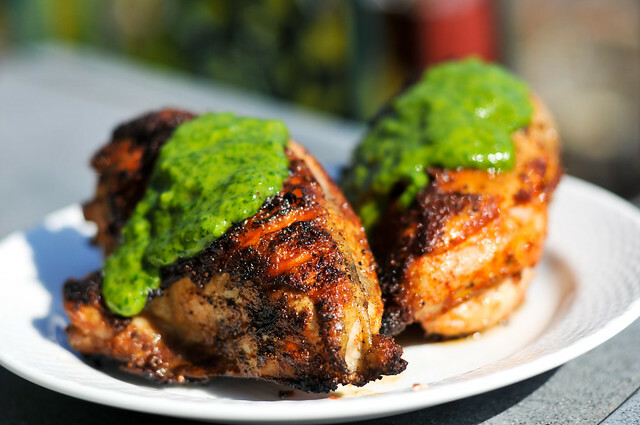 Getting giddy by the thoughts of what this trip may have in store, I busted out another Spanish-influenced recipe from the archive with these Spanish spice-rubbed chicken breasts with parsley-mint sauce. Hell yeah! I leave tonight for a nice long trip to Spain. It's been nearly four years since my last extended vacation out of the country, and over 14 years since I was last in Europe. Needless to say, I'm stoked. I even went back to read my old journals from my last European outing, and while I liked reminiscing about all that I saw, I was a little aghast that my backpacking buddy and I mainly sustained ourselves on pizza and pasta while in Spain—my modern day self could never go to San Sebastian without partaking in its culinary delights. With priorities changed, this trip will be decidedly different, and food culture is a top priority. 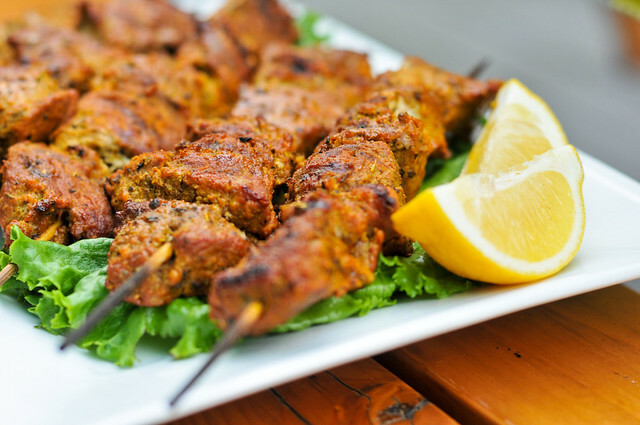 In honor of my trip, and its mainly Andulician focus, I give you these pincho morunos, or "Moorish skewers."